Absolute authority over employees would have its advantages -- for starters, your novelty plaque proclaiming absolute authority would no longer make you feel like an ineffectual liar. 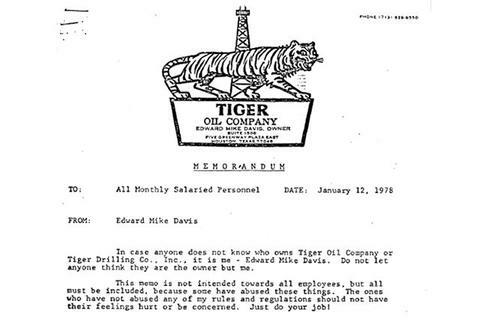 To meet a boss who ran things his way, all the way, read the Tiger Oil Company memos. On privilege: "I swear, but since I am the owner of this company, that is my privilege. That differentiates me from you, and I want to keep it that way." On workplace romance: "All scraps of metal, nails, pieces of pipe, etc. will be picked up and not left laying around in the yard. I want to see someone bend over other than me." On happiness: "There will be no more birthday celebrations, birthday cakes, levity, or celebrations of any kind within the office. This is a business office." Sadly, because of these and other Draconian policies (not paying for sick time, firing truckers who pop pills, banning in-office food because spills stained his carpets...) -- as well as Mike's masterful ability to not find oil, by 1980 the company had entered into the ultimate ineffectualness: bankruptcy.